Dogs are the most popular pets in the United Kingdom and like in many other western countries, dog ownership is at an all-time high. For many, a dog isn’t just a pet but valued part of the family. While the thought of losing a dog can be traumatic and upsetting, the truth is many dogs go missing each year. Some breeds are very skilled escapologists and can easily navigate over (or under) obstacles and fences you may have erected. With recent advantages in technology, most noticeably in mobile phones, GPS positioning and also battery life, there is now considerable demand for dog tracking devices. There are currently over 20 different brands available for you to consider but fortunately, we’ve done the research for you. Below you’ll find our guide to the top 6 dog GPS trackers you can buy today. But first; how do dog tracker work and what features should you look out for? Not all dog trackers are the same and some will have advanced features that you may feel are essential. 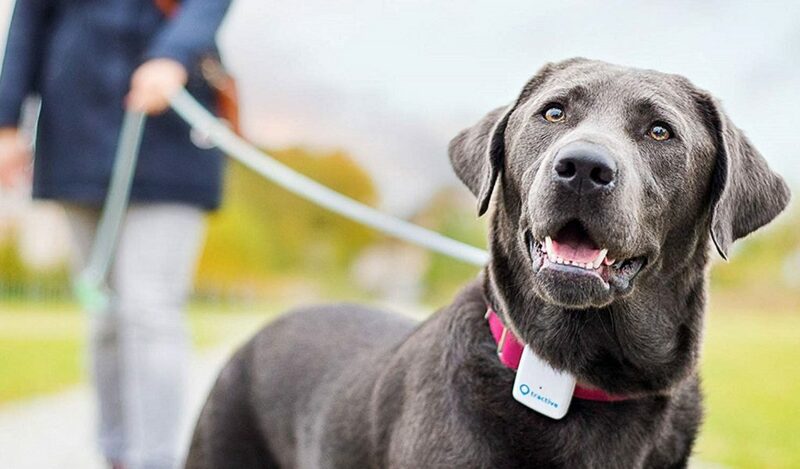 Dog trackers are devices connected to or built into collars. Once fully charged, you’ll be able to track the location of your pet in real-time – most GPS dog trackers update every 2-10 seconds so you’ll be able to see exactly where your dog is. Battery Life – Not every dog owner wants to remove the device and charge it up every 24 hours so check the expected battery life of the dog tracker. Some basic larger models with limited features may only need a charge every 4 or 5 days while smaller units packed with features require a charge each day or so. If you have a large dog the good news is you can buy XL dog trackers with a battery life of over a month! Charge Time – The faster the better but not essential if you get into the habit of taking your pet’s collar off each night and charge it. Virtual Fencing – This feature allows you to create an invisible barrier around your home or any other location, if the GPS collar detects your pet has traveled beyond this barrier, you’ll be notified via your phone app. This is a great option for pet’s that frequently escape and run off. Historical Location Data – This option is perfect for cat owners but may also be of interest to dog owners. If your dog tracker has this feature, you can see where your dog or cat has been and how long it stayed there. This is perfect for checking the day-to-day behaviour of any wandering pet. Waterproof and Water Resistant – Our pet dog Dixie never goes for a swim, in fact, she absolutely hates going any deeper than knee height! If your dog loves a good swim you’ll need more than a water-resistant unit, go for a fully waterproof dog tracker instead. Reliability – Needless to say, technology often fails, especially if it’s being dragged through the mud, bushes, pond water and more. The only way to check the reliability of a dog tracker is to read reviews from past customers with Amazon being a good place to start. Weight and Dimensions – The weight and dimensions of the dog tracker unit will be important if you have a small pet, less so for larger animals. Some trackers are built into the collar, other clip onto it, consider the weight, size and dimensions to see if it’s suitable for your pet. Monthly Subscription – GPS devices use mobile networks to send the coordinates to the mobile phone. There are two types of dog tracker for you consider; one that requires a sim card with a data plan that you’ll need to pay for (EE, giffgaff, O2 are the best options) or you can choose a dog tracker with a monthly subscription that includes mobile data. As one of the biggest selling tracking collars on the market, Tractive comes with half a decade of experience in the industry with Austrian-based developers. Sleekly designed as a small square attachment to your dog’s collar, Tractive utilises GPS technology to provide live tracking via an app accessible on your smartphone or other handheld device/tablet. This app is entirely free to download and includes a number of unique features such as live tracking in real time and a “Virtual Fence” mode. With the Virtual Fence, you can create a safe boundary for your pet, with the app instantly notifying you with an alert when your dog has left the designated confines of your set area. This can include just about anything, including your garden, street or even areas of your local park and countryside. What’s more, Tractive works seamlessly with a number of other applications developed by the company, including Tractive Photos, Pet BlaBla and Dog Walk, putting you into contact with a network of other pet owners. Tractive is ideal for independently spirited dogs, adding peace of mind to owners whose dogs like to run away or explore areas they shouldn’t. Designed for dogs over 4.5kg, the tracker sits easily on the collar with safe and quick detachment. The weight of the device does mean that smaller dogs (under the designated size limit) like toy breeds will find it invasive or heavy. Luckily, Tractive is completely waterproof for all weather walks, with tracking provided for just about any location in the world (well over 150 countries with a premium subscription plan), meaning that you can make use of the app when on holiday or in unfamiliar territories. 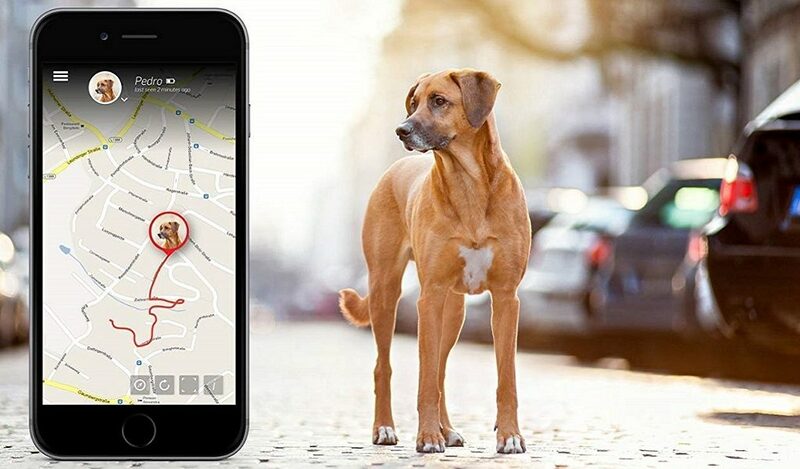 You can even track your dog when you are away on the opposite side of the world via your app. Your dog’s travel data is saved so that you can go back and log where your dog has been at all times, with the option of exporting this location data in KML and GPX format. To use the Tractive device, you must activate a monthly subscription in order to ensure adequate cellular network coverage. This is included for as little as £3.33 per month with more expensive plans also available. Its reliance on cellular coverage does mean that densely forested areas and high mountain/hilly regions can be very spotty, so this needs to be taken into account regarding its uses. In sum, this is one of the flagship GPS dog trackers with a solid reputation behind it and millions of customers worldwide with fantastic customer support. Subscription Required: Yes. Annual, biannual and monthly subscriptions available. Starts at £3.33 per month. The SARACL collar is a Chinese-designed GPS tracking device which works as an all-in-one collar for dogs (and large cats). Like other GPS tracking devices, this collar allows you to track the location and movement of your dog in real time, with a geo-fencing feature to trigger any movement in and out of a designated boundary with an alert. Available in a range of three colours (white, blue and black), the device is slim with a watch-like aesthetic. To track your dog, simply download the Amber 360 app (for Android and iOS) and enter your EMEI code for live tracking in real time. Amber 360 is a GPS tracking software platform used by numerous manufacturers of tracking devices, from baby trackers to watches. What’s more, because the SARACL is produced in China, it allows for Beidou locating (a Chinese alternative to GPS), although you are less likely to utilise this feature. Unlike other all-in-one products like the Tractive tracker, SARACL requires a SIM card to enable use of cellular 2G networks, and so requires a monthly/pay-as-you-go cost (rather than a subscription fee). The manufacturer recommends the providers 02 or Giffgaff in the UK, although any network will suffice (so long as they have adequate coverage in your area). This means that you can adapt your device for just about any location in the world by changing and updating your SIM card settings. A Nano SIM can be fitted quickly within the collar’s secure tracking box. Although the SARACL collar comes with a collar restricted by 28 inches, you can remove the tracker itself and place it on a new collar if needed. As such, the tracker is almost universal in its size requirements, although tiny toy breeds may struggle with an applied device. Other features of the SARACL collar include “historical track”, which retains information for 3 months. This “footstep” feature means that you can see all routes your dog has taken visually on a map. What’s more, users can share their information with other family members and users, with a chat feature in-app for user-to-user communication. Water, dirt and dust-proof, the SARACL is good for all weather conditions and muddy excursions. 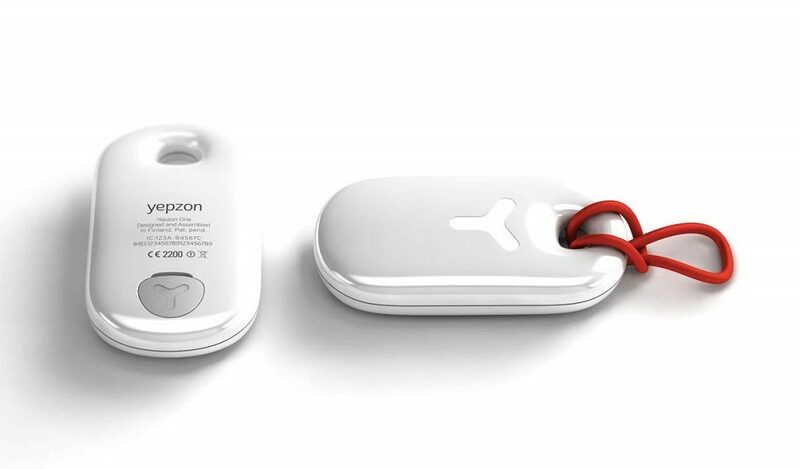 Yepzon is a unique multi-purpose tracker for use on just about anything, including dogs, children, cars and other forms of transport. Designed in Finland with company headquarters in India and USA, this clean, minimalist white device can be attached to the collar or harness of your dog securely with either an attachment ring or via an additional collar attachment accessory (as a housed zip case). The Yepzon works with 2G cellular networks to provide general locations and with GPS for smooth tracking outdoors. What’s more, built-in Bluetooth allows for a 50m non-satellite tracking radius. The built-in SIM unit is twinned with an intuitive and attractive Yepzon app available for free on your smartphone or tablet. With one month provided for free with every purchase, you must then either buy your annual subscription which starts at £3.33 per month or pay-as-you-go. Tracking in UK, EU, USA and Russia are provided in the standard data pack. The Yepzon’s tracking app allows you to set regular updates — between every 10 seconds and more infrequent intervals of up to 6 hours — which feed directly through your handheld device. Although you are unable to ping for an immediate location update, this regular monitoring is a welcome, customisable feature. Unfortunately, the Yepzon device does not allow you to geo-fence or set boundaries for your pet, which is perhaps one of the more vital features for a dog that is prone to run away or jump the confines of a back garden. Nevertheless, the lack of boundary settings and alerts is matched by the regular interval feed which will cover your dog’s whereabouts at all times. With waterproof construction and rubber protection against dirt and splashes, the collar is also suitable for even the rainiest days outdoors. Multiple users can also make use of the same device, with shared monitoring via the downloadable Yepzon app with absolutely no limitations. Because of the Yepzon’s strong design-build and multi-use purpose, it is one of the costliest dog trackers out there. However, it comes with the addition of foolproof security of your tracking data, with no personal passwords required or compromised. As one of the more stylish devices out there, it’s sure to satisfy more modish customers looking for something practical and fashionable. Furthermore, this device has an unbeatable battery length, lasting upwards of 2 weeks on a single charge. This longevity is perfect for holiday periods, with adjustable settings allowing you to take control of your device’s battery life. On absolute minimum settings, Yepzon has been known to last months! Subscription Required: Yes. Annual subscriptions, monthly bloc payments or pay-as-you-go data/roaming packages are required to use the device. The TKSTAR GPS Tracker is a pre-attached collar tracker with a sleek, white tracking unit featuring a blue paw logo. TKSTAR is a Chinese GPS tracking company producing a number of units for tracking pets, cars and people, among other things. As with many other similar collar trackers produced in China, it requires the use of a Nano SIM for 2G coverage in the UK and elsewhere, making it more adaptable and flexible than subscription-based trackers like Tractive. After being activated with a UK SIM, an in-house, rudimentary app is downloadable for smartphone and tablets (Android and iOS), with additional coverage via their tracking website. The tracking app itself has multiple features which are ideal for wandering dogs, including geo-fencing so that you can monitor your dog’s movement within a set boundary with instant notifications when your pet leaves the area. What’s more, regular pings and real-time tracking mean that you are constantly updated with your dog’s whereabouts. Although TKSTAR’s tracking app is noticeably clumsier than other dog trackers on the market, the device is fully waterproof with an adjustable collar for medium to large-breed dogs. The collar will even fit some smaller dogs and cats, although it will be too cumbersome for toy breeds. A handy SMS (short message service) tracking feature also allows for regular phone updates when you are not using the app. This works by “calling” the device from your phone. It will then text back co-ordinates which, when clicked, will open in google maps for a precise location. With additional coverage by AGPS and LBS, the TKSTAR tracker should operate for short distances underground or through tunnels when standard GPS falters. For users wanting to log their dog’s footprints, paths and destinations, you can make use of the historical track feature, showing you where your dog has been over the previous months. Another handy feature here that most other trackers don’t implement is a speed warning – alerting you when your dog has reached a faster speed than usual, to prevent theft or accidents. When your device is running low on batteries, TKSTAR have implemented a low voltage alarm to alert you to the power status. When the battery runs low, simply plug the provided charge cables for 2 – 3 hours or until the power bar is full. This lightweight, rainproof and shock resistant device is ideal for outdoor conditions, being resistant to mud, sleet and snow. Although the device’s collar is robust, users can disassemble the collar and place the tracker on their preferred collar or harness if so desired. Subscription Required: No. Requires a Nano SIM. Can be loaded with data as a pay-as-you-go device. Pet Trackie is a strong and waterproof GPS tracking device which slots onto your dog’s collar or harness. Like many of the best dog tracking devices on the market, this tracker has a dedicated app for handheld devices, with a number of fantastic tracking features to ensure you have control over your dog’s whereabouts. These include geo-fencing (known as the “Geo-Zone” feature), a custom-made virtual boundary with breach alerts should your pet leave a designated area. Fully adaptable to include everything from your garden to your street or a parkland area, this geo-fencing offers instant alerts for when your dog wanders farther than you’d like. What’s more, the app features live tracking in real time for constant and consistent dog monitoring at all times. You can share your dog’s location with up to 16 users, so that your family, friends, dog sitter and walkers can all be kept in contact with both you and your dog. Unlike other trackers with removable SIMs, the Pet Trackie is a subscription service with its technology already built in. The device has been purpose built for European use, although some 150 countries are included, which should be adequate for most — if not all — UK users. The subscription plan is not covered as a contract, but works as a pre-paid monthly deal at £4.49 per month with unlimited location data provided. Simply register your device with the Pet Trackie app, pay your first month and you are good to go. Although you cannot change your SIM, Pet Trackie utilises a unique non-fixed card which uses a number of different mobile networks for the strongest signals and coverage, enabling you to have ideal location tracking in even the weakest signal locations. For users wanting to keep a tab on where and when their dog has been travelling over a period of time, you can utilise a location history feature with this device, telling you where your dog was both yesterday and last month. If your device is running low on batteries, an alert messaging system sends a warning directly to your smartphone, allowing you to re-charge and re-use the device. With low battery consumption, most devices last 2 days on a single charge. The highly robust, shock resistant device is waterproof up to 1 metre for 60 minutes, meaning it can stand up to rigorous country or beach walks. Although the device is hardy, it is relatively conspicuous in comparison to other GPS trackers, offering reliability and functionality over fashion or elegance. As such, the Pet Trackie may also not suit toy breeds, although it can be attached to just about any collar. Subscription Required: Yes. Subscription is paid monthly with unlimited data at £4.49. 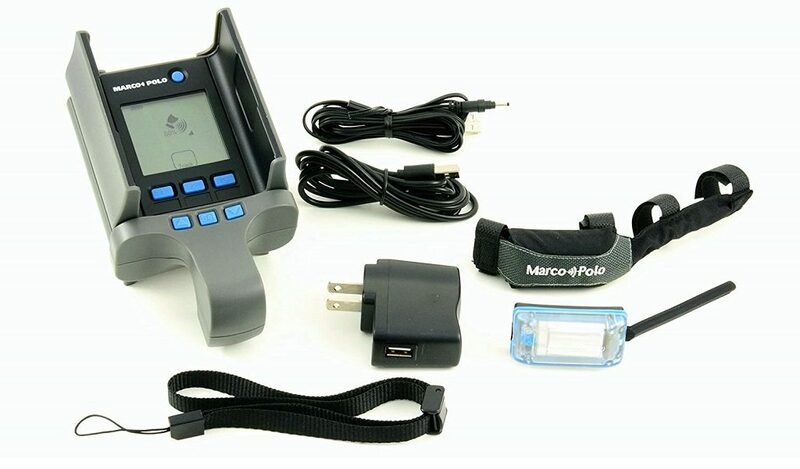 Eureka’s Marco Polo tracker is a pet monitoring device which works with radio signals for areas with poor — or no — GPS, cellular mobile or wireless coverage. Offering precise radio tracking, the Marco Polo is a perfect device for countryside dwellers at their wits ends with wandering dogs. Developed in USA, this device is an all-in-one, no contract, no subscription tracker, meaning that the up-front costs may in fact save you money over time. The device works anywhere — be it hill land, moorland, dense forest or woodland — for a reliable tracking solution in the remotest terrain. 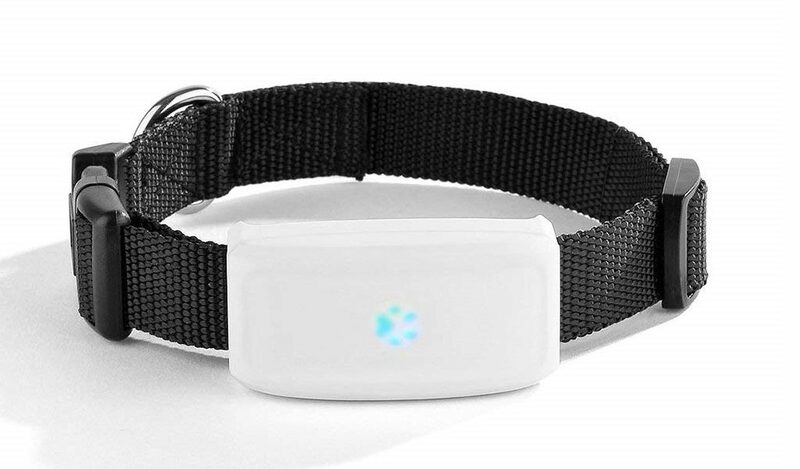 Consisting of a pet collar featuring a tracker and a fully rechargeable lithium-polymer battery, the user utilises a handheld locator which works like a personal radar system, scanning the surrounding area when activated over a range of up to 2 miles. Each time the pet’s tag receives a signal from the locator, it responds with its own signal. The locator then measures the signal’s strength coming from the collar to pinpoint its direction. Both the distance and direction are then displayed on the screen to help you find and follow your pet. If your pet has left the system’s 2-mile range, users can easily scan acres of land from their car with accurate 2-way radio feedback. 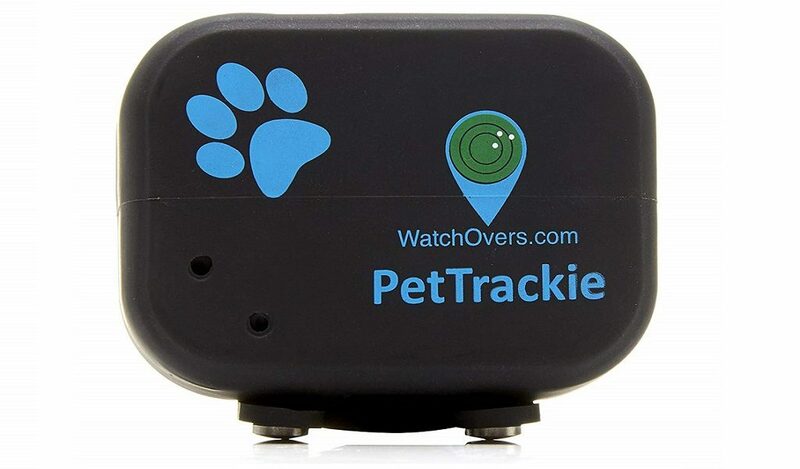 What’s more, the tracker works with up to 3 pets at a time, pinpointing their location on the screen’s monitor. This is ideal for night time conditions, as a solution for reluctant returning pets or Labradors with wanderlust. With an easy to use interface, there are additional features that help prevent your pets from going too far. These include a number of “safety zone” ranges, pre-determined distances which you can programme to receive warnings when your pet exceeds. These alerts will ping back to the handset in under 80 seconds, notifying you that your dog has gone too far. As the most expensive tracker on the market, Eureka’s Marco Polo is also by far the most robust, with no reliance on third-party software or GPS satellites. Simply turn it on and send your signal to receive location updates straight to your handheld tracker. Once charged, each collar has a longevity of some 6 weeks with continuous monitoring. This is because other devices utilise power-hungry GPS technologies which limit battery length. The collars themselves are made to be as robust and water resistant as possible, surviving dips in pools, puddles and lakes. Subscription Required: No. All costs are made up-front as this self-contained device requires no third-party information or cellular coverage. If you liked our list of the best dog trackers, we’re sure you’ll also enjoy our list of the best 50 gifts you can buy a dog owner and also our Beginners Guide to Owning a Dog. Our guide to the top 10 puppy training guides and aids is also popular with our site’s visitors.